Last week, my good friend Neil Patel wrote a post explaining why he would never live in a rich neighborhood. While I understood Neil’s main argument, I found the post quite amusing. It’s true that Neil does not live in a “rich neighborhood.” He lives in downtown Seattle in the private residences of the Hyatt Hotel. Downtown Seattle is a business district and not really a neighborhood. However, as business districts goes, downtown Seattle has to be the richest business district in all of Washington State. So while Neil may never live in a rich neighborhood, he has no problems living in a million dollar suite and taking advantage of all the amenities offered by the Hyatt. I currently live in West Vancouver, which happens to be the richest neighborhood in Canada. I’ve also lived in the Downtown Eastside, which is the poorest neighborhood in Canada. While I do have fond memories of the DTES, I much rather prefer my current neighborhood than my past one. As a rebuttal to Neil’s post, here’s why I live in a rich neighborhood. Every parents wants the best for their children. One of the main reasons we moved to West Vancouver was because of the school district. Generally speaking, the richer the neighborhood, the better the schools and West Vancouver has the highest ranked school district in the Province. They also have smaller class sizes and better equipments. Sending your child to the best school doesn’t guarantee they’ll succeed but it does mean they’ll get the best education possible and when it comes to Sally, I want to give her every advantage available. West Vancouver has no industrial zones and the commercial zone is limited to one main street call Marine Drive. Pretty much everything else is residential or recreational. The city has a bylaw preventing any business from operating 24 hours a day (the 7-11 has to close for a few minutes everyday) and there are no nightclubs, bars or casinos. You might say that sounds extremely boring but the point is I live in West Van. I don’t party in West Van. If I’m feeling the need to get into trouble, downtown Vancouver is just short drive across the bridge. The situation is ideal. I live in nice quiet neighborhood that’s just a hop, skip and a jump from the action of downtown. Providing a safe environment for my family is extremely important to me. 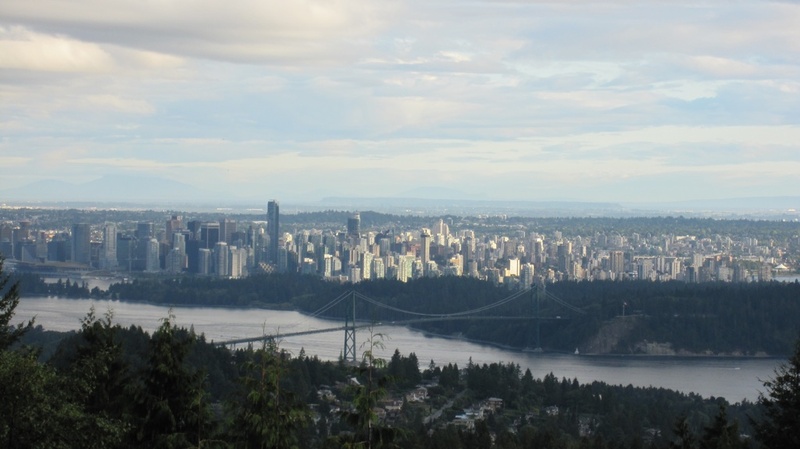 Rich neighborhoods generally have a lower crime rate and West Vancouver is no exception. The city reported 2,265 criminal code offenses in 2008. By comparison, the city of Surrey had 45,655 criminal code offenses during the same period. When I walk down the streets of West Van, I’m pretty certain I won’t be the victim of a drive by shooting or mugging. I don’t feel the same way walking down the streets of Surrey. I think the above photo speaks for itself. Have you ever noticed that successful people hang around other successful people? Birds of feather really do flock together. I’m comfortable living where I am because I can relate with the people down the street. My neighbors are mostly business owners and entrepreneurs. We have a lot in common. The networking and business opportunities are much better in West Van than the Downtown Eastside. The power of association is extremely powerful in the way it dictates who you are and how much money you make. If you want to change yourself or your lifestyle, then quite often, it will require you to change the circle of people you associate with. In order to continue climbing the ladder of success, I make sure I associate with other successful people. I thought I was doing well when I was making $10,000 per month. Then I started associating with people like Shoemoney and Neil Patel. Now, I can’t imagine living on only $10K per month. If you aspired to be more than what your friends want to achieve, then you’re going to have to find others at your level or above and start associating with them. It’s easier to find those people in a rich neighborhood like West Vancouver than a poor one like the DTES. Birds of feather flock together. Success breeds success. This is why the rich get richer. If you want to become rich, you need to hang where they hang. While Neil may say he’ll never live in a rich neighborhood, living in the Hyatt hotel isn’t exactly poor! Below is a video by super Realtor Jason Soprovich explaining more about West Vancouver. Give him a shout if you’re looking to move here.